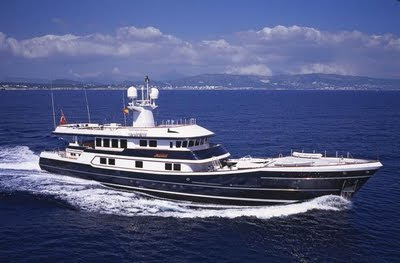 Shandor, the first true 'Expedition Yacht', offers the opportunity to explore the world in comfort and safety. She is one of the most seaworthy yachts of her size, is full of character and offers unparalleled deck and dining space - along with comfort and safety at sea. Shandor is different, Shandor is unique. Captain Jon Armstrong and his crew of 10 look forward having to your clients onboard. Discounted rate of €105,000 (from €125,000) per week for the month of August! Spacious Master Cabin located on main deck with full ensuite facilities including bath and whower, ample wardrobe space, office and setee. Two guest double cabins each have ensuite facilities and setee. Two twin cabins, each with pullman beds, with ensuite facilities.